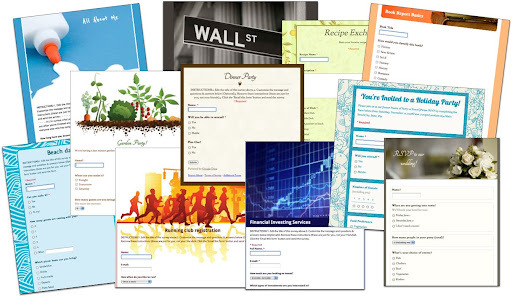 to Google forms, which take advantage of the new Google Font API and images from iStockphoto. As a reminder, when you're editing a form, click the Theme button to find the right theme and apply it to your form. I first got involved with themes at Google when I designed a few templates for the Google Page Creator launch in 2006. Since then, I’ve worked on a number of theme projects in my 20% time, as they presented a far different design challenge compared to my regular projects as a webmaster at Google. You can see my “Spring/Zen Branches” in a number of products. When I learned about the Google Font API, I wanted to give it a test drive by creating some new Google forms themes. Forms seemed like a good place to start, since they have a pretty standard structure, which makes them fairly simple to style. Initially I was just playing around with different font combinations, but when we added in imagery from iStockPhoto, things really took off. For example it made sense to create a wedding theme using cake imagery and the script font Tangerine, or a digital theme using binary number imagery and the monospaced font Inconsolata. And what better way to present a stack of old books than a font like Crimson Text, which brings to mind classical serif fonts from print? I had a lot of fun combining imagery, colors and font styles to match each other, and I hope you have fun using these themes on your forms. Today, I’m happy to announce that we’ve added 24 new themes to Google forms, which take advantage of the new Google Font API and images from iStockphoto. As a reminder, when you're editing a form, click the Theme button to find the right theme and apply it to your form.